Hancock, Hendricks, Howard, Madison, Marion, and Tipton. * Widespread showers and a few thunderstorms are expected tonight through this weekend. 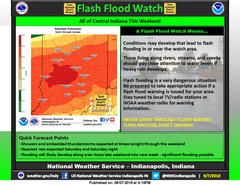 The rain will be heavy at times, especially Saturday into Sunday when flash flooding is possible. later updates on this developing situation.